Cast Of Horner Site Scottsbluff Point. This projectile point was discovered sometime during the 1977-78, 1980, 1983 & 1984 excavations of the Horner II site by the University of Wyoming. Earlier excavations of the Horner site (Horner I) was carried out by Princeton University in 1949 & 1950 and by the Smithsonian Institution in 1952. This point is described as falling typologically and technologically between the Alberta and Scottsbluff / Eden points but is considered to be a Scottsbluff style. 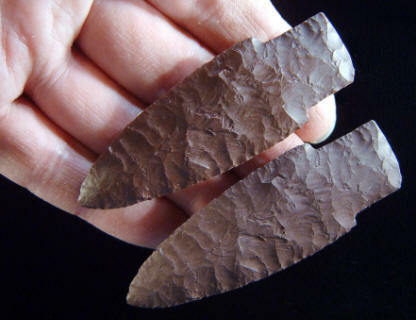 It represents one of 21 projectile points found during the University of Wyoming excavations and only one of five complete un-reworked points. This point is made of dark red Porcellanite and measures slightly over 2 7/8 inches (7.4 cm) long and 1 inch (2.5 cm) wide. Two basic typological point types are represented in the Horner II site excavation. All but one example are type I style points. This is a type I point that is considered to be a Scottsbluff style. These type I points have distinct stems with well defined shoulders. They have lenticular cross-sections and no medial ridge. Most of these points are thickest at or slightly above the shoulders and they have flake scars that are shallow with irregular spacing. The Horner site was discovered by Jimmy Allen on July 2, 1939 while he “walked down the (Shoshone) River to Sage Creek, hunting arrowheads.” The site was later recognized as the representative type site of the Cody Cultural Complex. The site was named after Pear Horner, the owner of the land. The Horner site is located in northwestern Wyoming in Park County 4 miles northeast of the town of Cody. The site is also situated on a 150 foot terrace near the confluence of Sage Creek and the Shoshone River.